April 18, 2016, 12:13 p.m. Though about half of Americans say they get news from social media, they don’t have much trust in what they read or watch there, according to a study released Sunday. 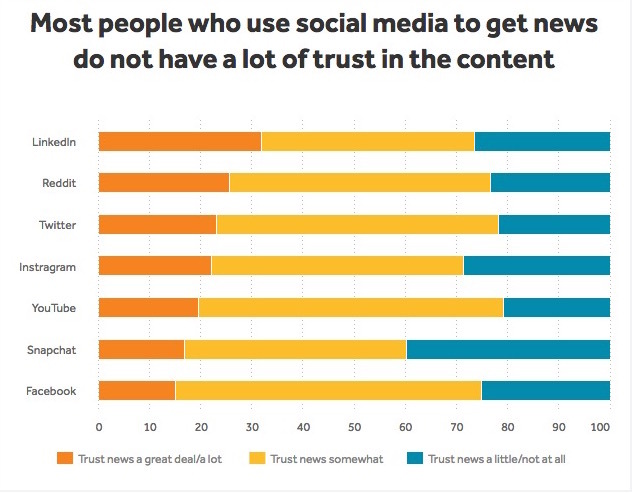 Less than one-quarter of social media news consumers said they trust news from those sources “a great deal or a lot,” according to the report. Just 12 percent of respondents said they trusted news they found on Facebook and 18 percent said they trusted news on Twitter, the study found. These findings are part of a study examining trust in news by the Media Insight Project, a joint effort between the AP-NORC Center for Public Affairs Research and the American Press Institute. The report covers the full spectrum of the news media, and also highlights how certain aspects of digital news impact trust. The survey found that 51 percent of Americans get news on social media, with 87 percent of that group getting news from Facebook. Twenty-one percent of Americans who get news from social media get it on YouTube, Twitter is next at 18 percent. Nearly 7 in 10 of those who get news on Facebook (66 percent) cite this as a critical factor in their decision to trust the content. Six in 10 (62 percent) say so about Twitter and somewhat fewer (57 percent) about YouTube. The reputation of the person who shared the material is a less frequently cited factor, though still sizable. That factor is very important to just under half of users of most networks. On the other hand, the popularity of the post itself, how many people shared, liked or commented on it, does little to affect trust. About 1 in 5 people say the number of others who have liked, shared, retweeted, or commented on a piece of news or information impacts their trust in the information. 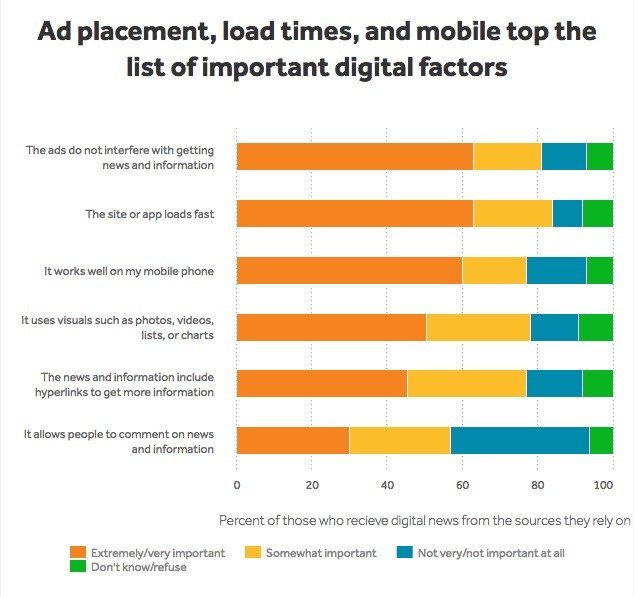 When it comes to digital news though, the most important factors for users are ad presentation, how sites render on mobile, and load times, the survey found. Sixty-three percent of users said it’s important to them that advertisements not intrude on editorial content, 63 percent of respondents also said it was important that sites load quickly, and 60 percent of users said it was critical that news sites work well on their phones. 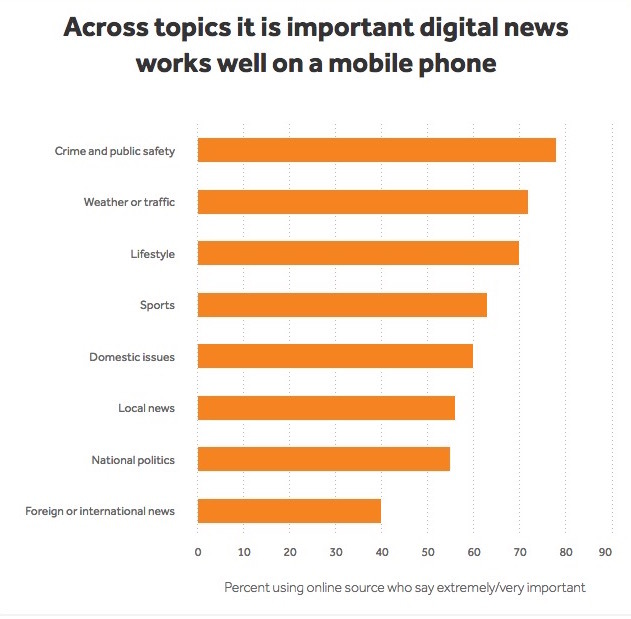 Respondents said it was most important to them that crime and public safety coverage, along with weather and traffic news, work well and load fast on mobile. Both the survey and the qualitative research findings make it clear that it is important whether or not ads display in a way that interrupts what they are doing. The interviews showed that most news consumers know advertising is part of the business model and often enables the free access they expect. However, when people see advertising, they say they want it to be of a similar tone and topic to the news content and mesh visually with the page. In contrast, irrelevant, off‑tone, or jarring ads can really bother people. Even worse were ads that monopolized the screen. 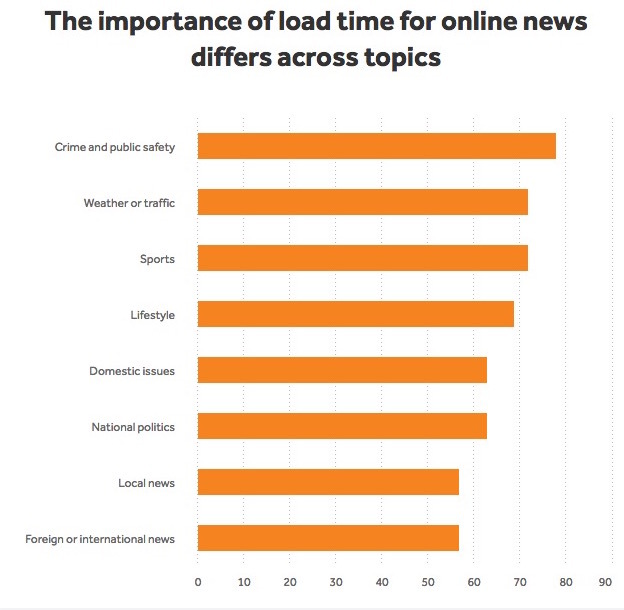 Interestingly, the ability to comment on the news registers higher for crime news than other topics. 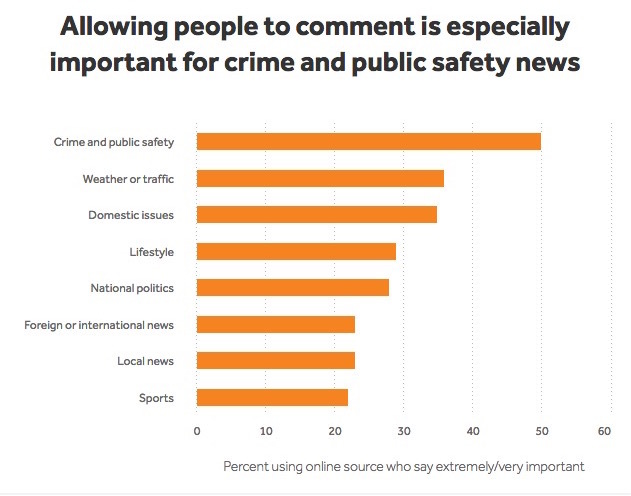 Fully 50 percent of avid followers of crime and public safety news rate the presence of and ability to post comments as very important in their choice of news source compared with just 22 percent of people talking about sports and 29 percent of people talking about lifestyle news. Lichterman, Joseph. "Americans don’t have much trust in social media as a source of news, a new report says." Nieman Journalism Lab. Nieman Foundation for Journalism at Harvard, 18 Apr. 2016. Web. 25 Apr. 2019. Lichterman, Joseph. "Americans don’t have much trust in social media as a source of news, a new report says." Nieman Journalism Lab. Last modified April 18, 2016. 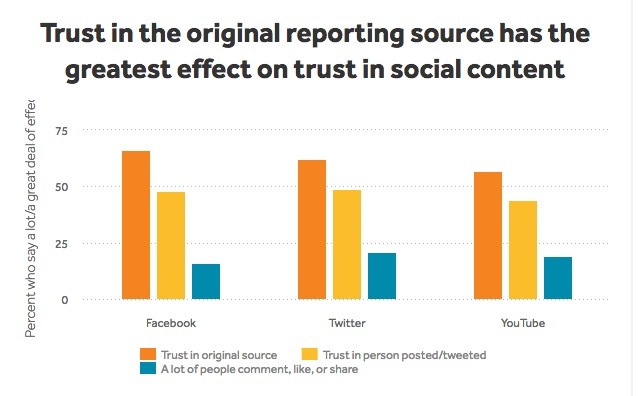 Accessed April 25, 2019. https://www.niemanlab.org/2016/04/americans-dont-have-much-trust-in-social-media-as-a-source-of-news-a-new-report-says/.